Houston Police Chief Art Acevedo asked for prayers for his officers. The officers were met with gunfire "immediately upon reaching the door" while serving a search warrant at a home in southeast Houston, according the Houston Police Department. "This has been a tough day for our city. I encourage all Houstonians to pray for our police officers who were shot today," Houston Mayor Sylvester Turner said during a press conference on Monday. "One will be discharged tonight, thank goodness. Pray for their families, too!" 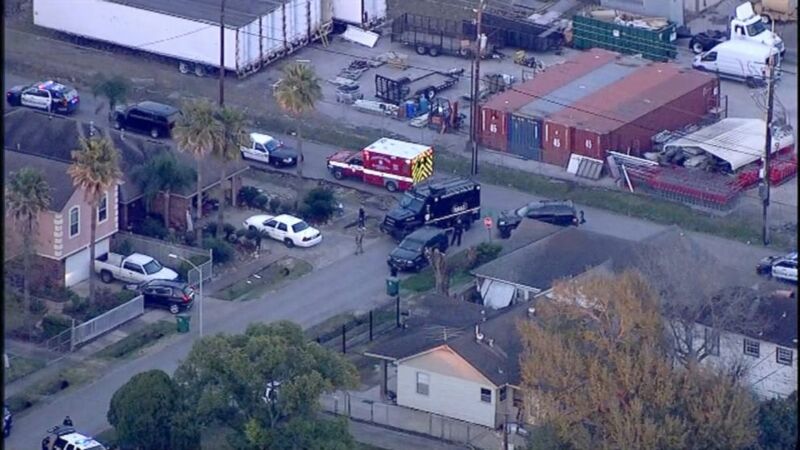 (KTRK) First responders on the scene in Houston where multiple police officers were shot, Jan. 28, 2019, in Houston. "As a result of exchange of gunfire between our officers and one or two suspects, we have five officers injured," Houston Police Chief Art Acevedo said during the press conference. "Four were struck by gunfire, two officers are currently in surgery. They are in surgery for gunfire sustained and they are in critical but stable condition. We're hopeful that with the prayers of this community that they will recover." Texas Gov. Greg Abbott offered his condolences in a statement in the wake of the "horrific attack." "This evening’s horrific attack on police officers is a solemn reminder of the service and sacrifice our brave men and women in law enforcement make every day to keep us safe," Abbott said. "The city of Houston and the Houston Police Department will have whatever state resources they need to bring swift justice to those involved."